Contrary to previous posters - Didn't have time to go in but it seems that this is a proper functioning pub again by the look of it. Landlord seems to be trying hard to offer an alternative to the 3 pilchards and the Blue Peter. Hope it works out. This pub has closed for good: the workmen are in and the planning permission notice says 'take away'. Still very much an ex-pub and no further action seems to have taken place when I looked in the window. 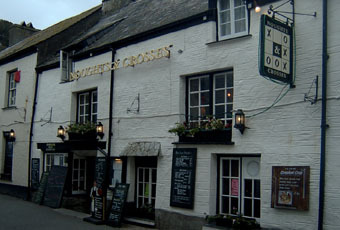 We were in Polperro last week and heard that this pub is going to re open soon. We have never used it in the past as we generally use the Crumplehorn at the top of the village. There are already 2 other pubs in that part of the village so I wondered whether another pub is needed. Maybe the locals know more?